It is a stunning 92.7° outside. 92°. Even after 8PM. It is just barely June. This is almost 20 degrees above the seasonal average. It feels like August. This is so wrong! So what did I decide to cook? Did I have a cool, crisp salad? Did I just lie on my floor, alternating slices of cucumber between my eyelids and my mouth? Nope. I made chicken-fried steak, mashed potatoes, and gravy. Why? Because apparently, the heat has made me insane. Or maybe I can blame it on my Arkansas-born father, say that I am simply channeling the Spirit of the South. You know that Spirit? The one that makes you crave stewed collards, macaroni and cheese, and smoked meat in the wilting Delta heat? You don’t actually need a recipe for chicken-fried steak, but for reference, I give you the link to the Pioneer Woman’s version here. Love her or hate her, the Pioneer Woman’s blog is terrific form of escapism. Everything about Ree Drummond’s life seems beautiful: she’s beautiful, she has beautiful children, her kitchen is huge and beautiful, her ranch is beautiful, her friends and family are beautiful, her photos are beautiful. Everything is highly calorific, and all the colors are super-saturated. And her bodice-ripper stereotype of a husband is every woman’s dirty, little secret fantasy. The Pioneer Woman’s little slice of Oklahoma seems fantastic too. True, there is a lot of backlash (some of it really funny, like this and this), but you can’t deny that Drummond makes American Comfort Food look really, really good. Plus she slayed the Flay in Bobby’s Food Network Thanksgiving showdown. Kudos. So, how do you make chicken-fried steak without a recipe? First of all, pat the cube, or minute steaks dry with paper towels. In a large shallow dish, pour in about half a cup of milk. Beat 2 eggs into the milk. In another dish, stir together about 4 heaping spoonfuls of flour, about a teaspoon and a half of salt, a lot of freshly ground black pepper, and whatever seasoning you want to add (seasoned salt, paprika, cayenne pepper, garlic powder, onion powder). Coat each steak, one at a time, with the milk and egg mixture. Dredge each steak with the flour. Dunk each flour-covered steak back in the egg and milk mixture, and redredge each in the flour mixture. Place them on a clean plate after you are done. In a large cast-iron skillet, heat about 1/4 inch of canola oil over medium-high heat. You want the oil to just start to smoke. When the oil has reached a good temperature, add the steaks to the pan, being careful not to overcrowd it. Fry each steak until each side is golden brown. Remove the steaks to a paper-towel covered plate the drain. Pour off all but about a 1/4 cup of oil. Add a heaping 1/4 cup of flour to the pan, and make a roux. Brown the flour so that your gravy doesn’t have that raw flour kind of taste. It should be golden brown when you pour in the milk (about two cups). You will end up with a lot of gravy. Whisk the gravy, breaking up any lumps, until you have the consistency that you want. This can take between 5 to 10 minutes. You might have to add more milk if the gravy starts to look too thick. Adjust the seasoning as you go along, adding more salt and black pepper as needed. 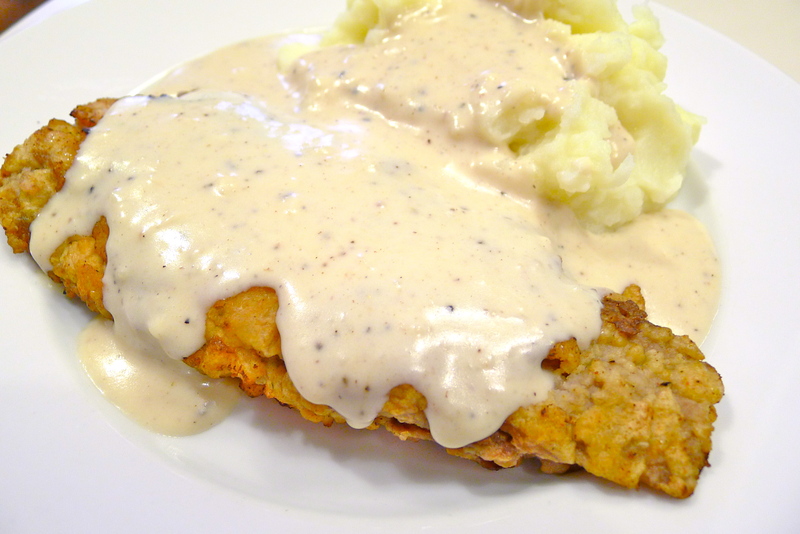 Ladle a generous amount of gravy over your chicken-fried steak. If you serve your chicken-fried steak with mashed potatoes, you can cover your spuds with the gravy too. Enjoy responsibly: make this in November, not during a heat wave like now! There’s also a kitchen machine named “Fast Cutlet Maker” that pounds the meat lobes and after it have clear squared pattern on it. Its very popular in Germany.